Playing Lumina is wanting to write a new theme for every scene! It's inspiring, well put together and a great inspiration for any composer. And it's Dutch! 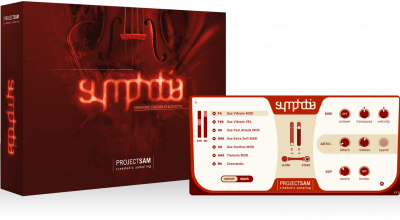 Discover the fully updated 1.6 Editions of the orchestral library series that forever changed the film scoring game: The Symphobia Series. 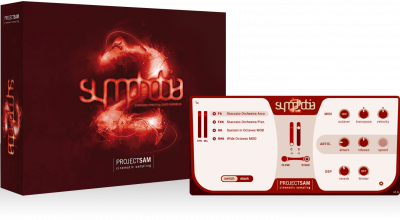 With Symphobia 1 and Symphobia 2, ProjectSAM explored the heavier side of orchestra to help you thrill directors and audiences around the world. Lumina’s solo and guest instruments range from legato woodwinds, such as oboe and clarinet, to a beautifully sampled celtic harp, tin whistle and… a full bell tower! The library also pays homage to the playful world of cartoons with dedicated ensembles and phrases for careful tiptoeing and tongue-in-cheek suspense. Of course you will find ProjectSAM’s popular Dystopia section, too, with all-new sound design based on the library’s samples. 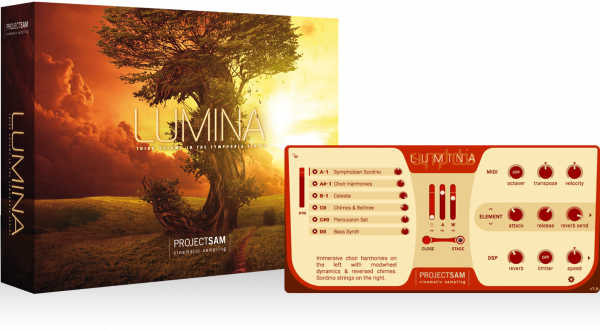 Lumina is a journey of inspiration… as for each note you play, three more will spring to mind. 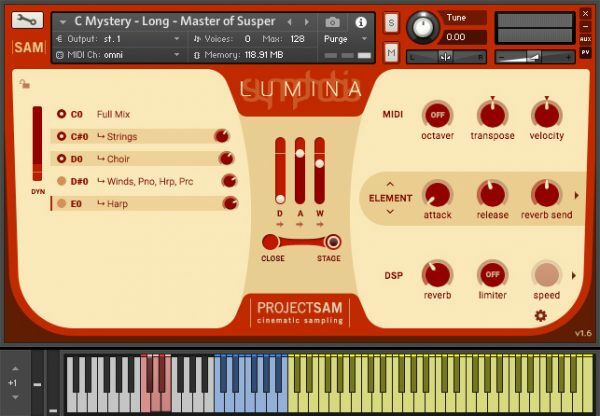 Using clever keyboard mapping and controller assignments, Stories give you numerous musical features on one keyboard − all within a single Kontakt track. In this way, the library’s ensembles, solo instruments and textures all take part in a bigger Story. ￼We booked new recording sessions to record individual sections for the library’s textures, worth 7 GB* of new samples. 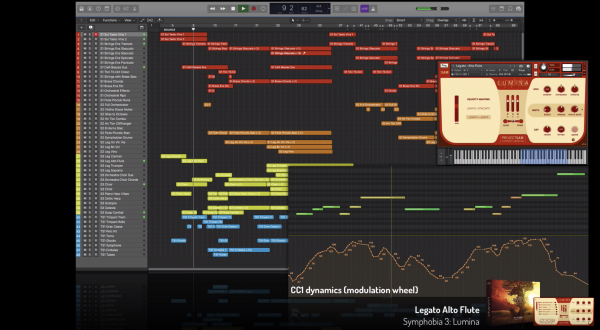 In SYMPHOBIA 3: LUMINA 1.1, the majority of orchestral textures now offer the ability to perform the following sections individually: strings, choir, woodwinds, piano/harp/percussion. 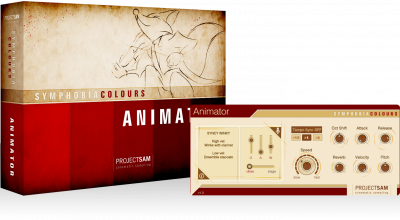 The exact sections available differ per texture instrument. The 1.6 Edition of Symphobia 3: Lumina offers over 16 new features, including improved control over articulation locking, legato performance, round robin and mic output routing. As always, this update is 100% free for all existing Lumina users! 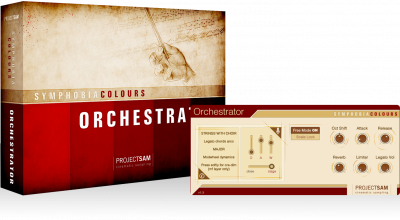 It's hard to think of a more inspiring tool for kick-starting an orchestral composition. This is amazing. It's a super different, unique and, most importantly, inspiring addition to my orchestral library. It's the most fun thing to play for scoring I've come across. Laughing clarinets, jazzy staccatos, xylophone winks and trombone slides – Animator is a library dedicated to all things funny. The library that started it all… immersive ensemble recordings and intense cinematic orchestral effects. With Symphobia you have at your disposal a proven tool of inspiration for scoring films, games and television. An industry first: real legato transitions for performed chords. ProjectSAM recorded major and minor chords with all possible transitions between them.